In addition to her main job as a nursery teacher in Soc Son district (Hanoi), Ms. Nguyen Thi Van boldly borrowed money from TYM to start a business and “encroach” to the art field: traditional rice painting. Ms. Nguyen Thi Van, born in 1978, is a member of TYM Soc Son Branch, Hanoi. She has just received the good news and would be awarded the “CMA 2018 Typical Micro Entrepreneur with innovative ideas” with the business model of traditional rice painting. Ms. Nguyen Thi Van works for a long time as a preschool teacher. Such the interesting job has nurtured her passion for painting and making crafts. Thus, she chooses rice paintings to satisfy her passion and creativity. This business could also bring about economic benefits for her family. 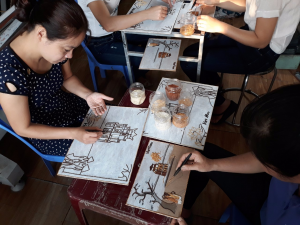 According to Ms Van, making rice paintings is also to enrich the culture of Vietnam, inspire the love of the country for young people and introduce Vietnam to international friends in a new way. So, in 2016, when she was 38 years old, from a kindergarten teacher, Ms. Van started to do such the new business. In Ms. Van’s family, there is no one working in the art field. The village where she lives do not also specialize in making rice paintings. Thus, when the new idea comes up, she has almost no knowledge and skills about rice painting and has to learn everything. When starting this business, she and her husband and children had to search everywhere, explore and learn about techniques as well as select the input materials, look for patterns to suit the tastes of the market. It was then that she decided to use the manual method of roasting to color the grain because although it takes a lot of effort, time and requires more technique than the dyeing technique, it is non-toxic, safe for users and brings many imprints of workers. Difficulties in the first days may not be counted: from lack of knowledge, lack of skills, to lack of output and especially lack of capital. But thanks to the determination of the couple, the new business has gradually step by step stabilized. Their products become well known. When she first started her business, Ms. Van faced difficulties in finding capital. She started to join TYM since 2012 with the first loan of VND 7 million. So far, she stays with TYM and avails more from time to time. TYM’s loan not only helps her solve the problem of capital shortage but also supports her business operations. Although she also has a number of customers, her products are not widely known. Through trade fairs organized by TYM, she has the opportunity to introduce her rice painting products to many more customers and even foreigners. Not only that, TYM keeps on an effort to introduce her products to the market by selling her rice paintings at TYM’s store at 20 Thuy Khue street, supporting her to participate in big fairs. Her rice painting is a cultural gift selected by many customers, especially foreigners. This rice painting product is not only a cultural gift of Vietnam, but also a product of women – an outstanding TYM member who always strives for a better life. Until now, when the business expanded, Ms. Van hires and creates jobs for 6 regular and 4 seasonal workers. She believes that with the passion, constantly trying and learning, it is never late to start a new business. On 12/12/2018, Citi-Vietnam Micro Entrepreneur Award Ceremony 2018 (CMA 2018) was held in Hanoi. This year, Tinh Thuong Microfinance Institution – TYM (under the VWU) received awards in both the award categories for the institution and clients. For the institution category, TYM was honored to receive the award “CMA 2018 Typical Micro Entrepreneur with innovative ideas”. For the MFI client category, TYM has two members awarded this year. Specifically, Ms. Nguyen Thi Van, a member of TYM – Soc Son Branch, Hanoi with the model of rice painting was awarded the “CMA 2018 Typical Micro Entrepreneur with Creative Idea”. The other member, Ms. Quach Thi Huong, a member of TYM – Kim Dong Branch, Hung Yen, with the traditional incense model was awarded the “CMA 2018 Typical Micro Entrepreneur”.